Alfa Laval AlfaCond condensers are specifically designed for condensing of vapour under vacuum. These plate surface condensers are ideal for use in applications such as vacuum condensers in evaporation systems, ethanol condensers in bioethanol plants, pan vapour condensers in sugar refineries, and as turbine condensers in small power plants. With its compact design, AlfaCond is easy to install where space is crucial. Highly efficient and very compact, AlfaCond is the world's first plate condenser specifically designed for condensing under vacuum. Due to its compact size and efficient design, AlfaCond has become the preferred alternative to bulky indirect shell-and-tube condensers. Also, AlfaCond is easy to clean by means of Cleaning-in-Place (CIP) or mechanically. AlfaCond is an alternative to direct condensers when condensate recovery is the goal and when there are space constraints. The AlfaCond can be configured with or without subcooling of the condensate. Non-condensables are removed from the condensate outlet pipe and led to the vacuum system. 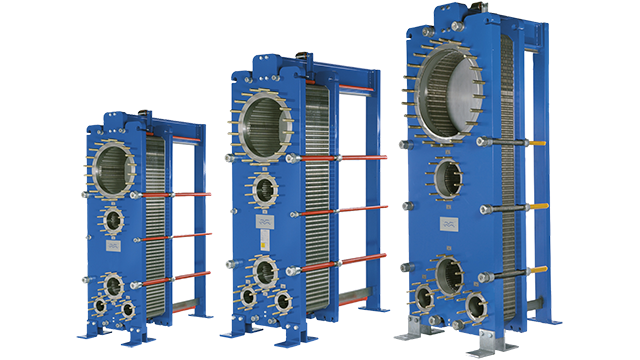 Equipped with well-designed features, AlfaCond heat exchangers are easy to maintain and have a long service life. AlfaCond features the glued gasket, which is a two-component, oven-cured epoxy glue keeps the gasket in place during any possible cleaning condition. Additionally, the pressure plate roller, the bearing boxes on tightening bolts, and the 5-point alignment system with reinforced hangers make opening and closing the heat exchanger quick, and easy without the need for heavy tools or the risk of damaging the plates. The heat transfer area of a gasketed plate-and-frame heat exchanger con sists of a series of corrugated plates, assembled between the frame and pressure plates, which retain the design pressure. The sealing between the plates on the AlfaCond alternates between laser welds and gaskets. It has a unique porthole configuration that is specifically designed for vacuum condensation. 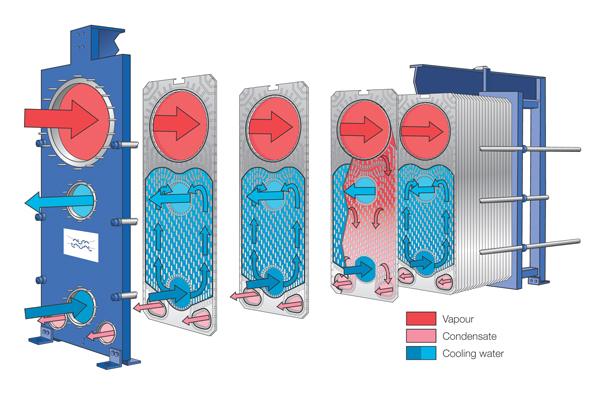 Vapour condenses in the welded channel and the cooling water passes through the gasketed channel. The channel gap size is asymmetric with a larger gap on the vapour side and a smaller gap on the cooling water side. The result is a very low pressure drop on the vapour side and high velocity and turbulence on the cooling water side. Together, these maximize heat transfer efficiency and minimize fouling.